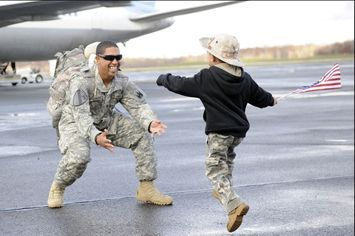 Military families are overstressed when through the deployment period of the mother or father. We, as adults can cope in many different fashions with the process, unfortunately children lack of the maturity and the psychological skills required undergoing through this difficult phase. In this section we will discuss how to help your school aged child with the process; a similar model can be used for toddlers with simpler language appropriate for their ages. It is important to know the different reactions a child between ages 6 to 12 may take; let’s see! · Feelings of guilt, confusion, irritability, depression, anger and concerns. · May use aggressive behavior to cope with frustration. · Show resentment to the deployed member for not being present. · May show changes in sleeping, eating and school habits. · Mood swings, disinterest, loneness. · Recurrent nightmares with death, loss or tragedy. parents, friends, familiars or teachers. It is extremely important that children of deployed military members keep their normal home and school routine to provide a sense of security and belonging. Both parents have to establish dialogs with the child before, during and after deployment period. Explain the transition and reinforce your family ties through activities as simple as road trips, watching a movie together in bed, cooking a batch of cookies and share with neighbors or school peers, house chores, etc. Ask questions to make sure your child understand the deployment process according to the age. Questions such as: What do you think? Or what do you feel about? Are good icebreakers to start a good conversation. This is a period where the parent at home must keep close relationship with children by involvement in all the activities that the child participates such as clubs, friend’s gatherings, sports and other activities. It is a good opportunity to enroll your child in fun activities and camps where he can express his abilities, learn new skills and develop healthy friendships. Quality time with your child is the clue to keep family ties together and be a supporting person through this difficult moment in your child’s life. Keep in touch with the deployed parent in any possible way to maintain that connection that is part of your child’s emotions and personality. Be creative; write letters, send drawings with love messages, if possible connect through Skype or facetime to have image contact reinforcement, maintain a diary of events to share through mail, etc. Most importantly: be honest and in a simple wording with calmness and patience explain to your child the process that all of you will be facing and that family together can overcome any obstacle, explain that it is a transitory situation of self adjustment and show effectiveness and love to all members. Time goes quickly, and when the deployed parent is close to come home, let your child participate with ideas about how to welcome the family member. It is a great joy, as it marks the end of this period and fills the air with new hopes, new meanings and happiness. During this process, the assistance of a health and mental professional is a great support for all family members, especially during crisis periods. If there is unfavorable news or uncomfortable situations to report, seek professional advice to address your current situation in an appropriate manner to help your child cope with his reality.